When tourists first visited Koh Phangan in the 1970s there was no road to Thong Nai Pan. The last part of the journey from Thongsala had to be done on foot or by boat. Footpaths were important travel routes. One route that has sadly disappeared in Thong Nai Pan is the path over the rocky headland that divides the northern Thong Nai Pan Noi from its larger southern sister, Thong Nai Pan Yai. It is a path that saves a lot of time. The alternative is to take the main road up the hill and down the other side. The present journey on foot between the two beaches takes about 30 minutes. Panviman has occupied the Noi side of the peninsula for over 15 years and has had an impact on the accessibility of the peninsula. 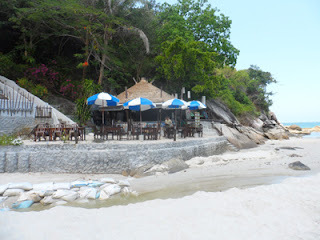 They have also recently secured a spot on yai beach at the bottom of the rocks. Previously they have built walk ways partly around the peninsula for guests to access villas and take in the scenery. There used to be a very faint track that if you slipped quietly along let you take the short cut from one beach to the other. This path is now mostly used by Panviman staff. The development of this great spot straddling the two beaches seems to have closed the rock-route between the beaches. On the rocks around Panviman there used to be a colony of giant lizards that you could spot sunning themselves most days. There numbers have dwindled. The future surely for Panviman is to make the hotel one that offers its guests easy access to not one, but two fantastic beaches. It is a unique selling point.